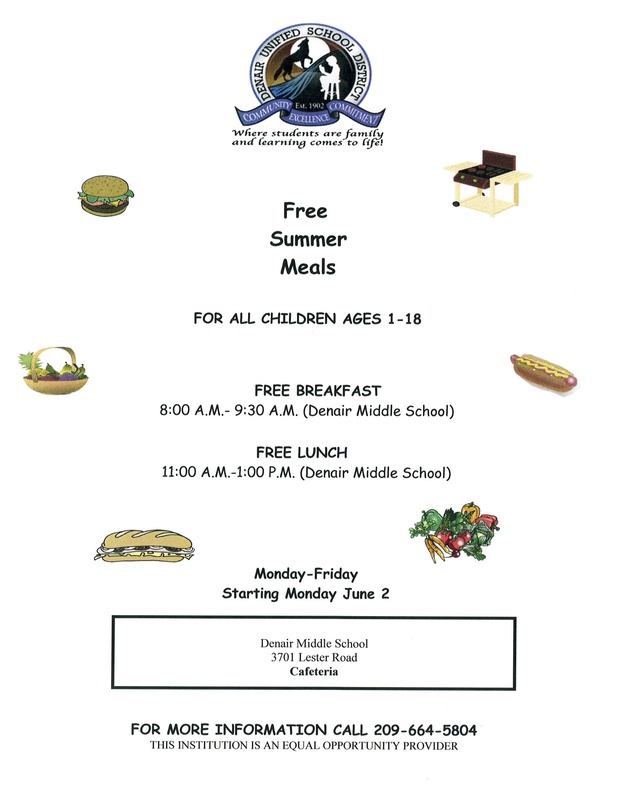 All children 18 and under who live within driving distance of Denair Middle School are invited to participate in a free breakfast and lunch program beginning Monday. 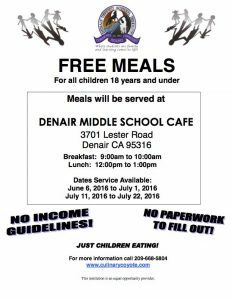 Children do not have to attend Denair schools to participate and there is no income or other eligibility restrictions. The program is a collaboration of the Denair Unified School District and the California Department of Education,using federal grant money. 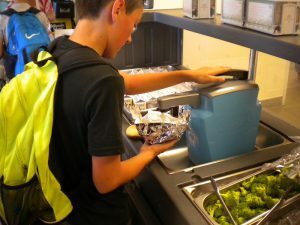 “Just show up and we’ll feed you a delicious, nutritional meal,” said Billy Reid, Denair’s food services director. The program will be run from June 6 to July 1 and again from July 11-22. Breakfast – including plenty of locally grown fresh fruit and milk – will be served from 9 to 10 a.m. Lunch – featuring fresh vegetables, more milk and healthy juices, plus favorites such as hamburgers, burritos, peanut butter and jelly sandwiches, and pizza – will be served from noon to 1 p.m. The menu will change daily. 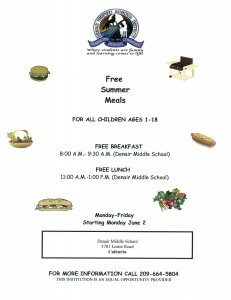 Denair Unified School District is offering free breakfast and lunch for all children, up to age 18. Both meals are served Monday through Friday, June 6, through July 1, 2016 and July 11, through July 22, 2016. Breakfast is served in the Denair Middle School Coyote Center, 3701 Lester Road, Denair, from 9:00 am to 10:00 AM. Lunch is served in the Coyote Center from 12:00 pm to 1:00 pm. For more information call (209) 664-5804 or visit www.culinarycoyote.com. Denair Lions Community Pancake Breakfast is being held on Sunday, November 2nd, 7 am – noon, at the Denair Community Center, 3850 N. Gratton Road, Denair. They will be offering delicious pancakes, eggs and ham, with a choice of coffee, juice or milk. Donations gladly accepted at the door. This year’s event is being held in memory of Lion Bill Smith and a portion of the proceeds will benefit the Denair Unified School District baseball facilities. A flyer for the event can be downloaded here. 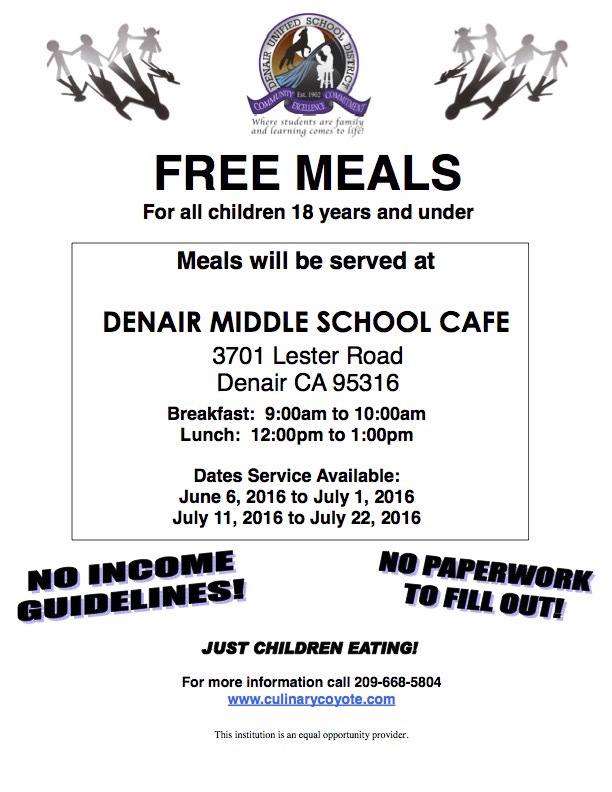 Denair Unified School District is offering free breakfast and lunch for all children, ages 1 to 18. Both meals are served Monday through Friday, throughout the summer months. Breakfast is served in the Denair Middle School Coyote Center, 3701 Lester Road, Denair, from 9:00 am to 9:30 AM. Lunch is served in the Coyote Center from 11:00 am to 1:00 pm. For more information call (209) 664-5804. 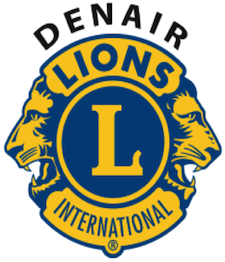 Denair Lions Club will be hosting their annual pancake breakfast on Sunday, November 3, 2013, from 7:00 am to 12:00 pm., with proceeds to benefit the Denair Lions Youth Football & Cheer. The event will take place at the Denair Community Center, 3850 N. Gratton Road, Denair. They will be offering delicious pancakes, eggs and ham, with a choice of coffee, juice or milk. Donations gladly accepted at the door.